A decade ago a paper called “Bitcoin: A Peer-to-Peer Electronic Cash System” was posted to a mailing list discussion on cryptography by someone calling themselves Satoshi Nakamoto. The identity of the author, or authors remains a mystery. Fast forward to today and Bitcoin has become one of the most talked about and controversial technological innovations of our time. Bitcoin is software designed to allow people to exchange value directly with a digital currency, without any middleman. The units of currency that run on the Bitcoin network are called bitcoins. The number of bitcoins allowed to be issued has been limited to 21 million. But each bitcoin can be divided to the eighth decimal place so it can be used in very small amounts. The Bitcoin network runs on a global, decentralized, self-clearing ledger called the blockchain. Every bitcoin transaction, since the beginning, has been recorded on the blockchain and cannot be erased or altered. The blockchain is a public spreadsheet maintained by its users. It is completely transparent. No one person or entity controls it. This whole area is also unregulated, not subject to any legal jurisdiction, not backed by any legal entity and the value of its coins is determined by its marketplace, which as we have seen from its history fluctuates wildly. Most WEALTHTRACK guests think that bitcoin and other cryptocurrencies are a disaster waiting to happen, a speculative bubble bound to end in a trail of tears. One of them is Michael Hartnett, Chief Investment Strategist at Bank of America Merrill Lynch Global Research. 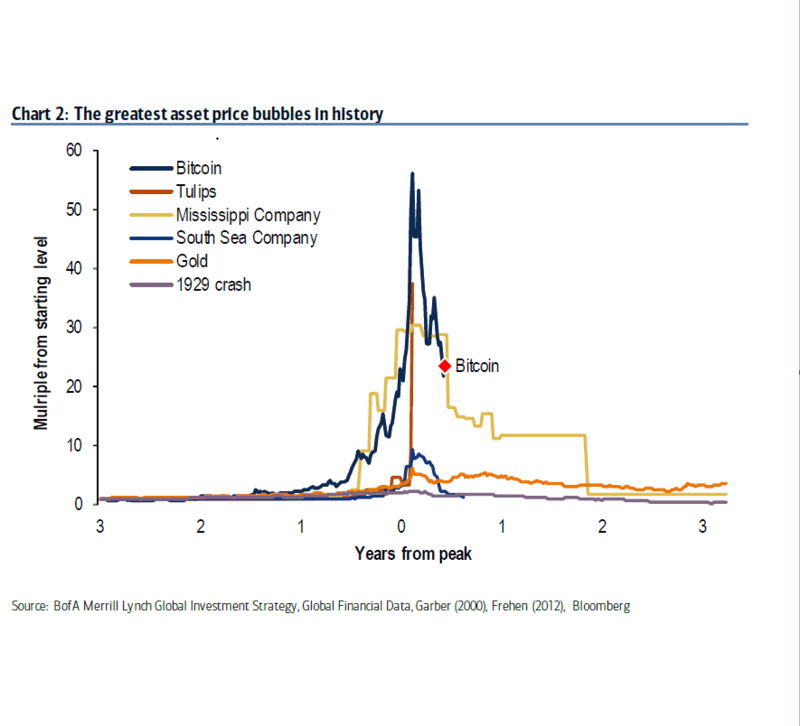 In a recent note Hartnett and his team published this chart comparing Bitcoin’s performance to other famous financial manias including the Dutch Tulip bubble in the 1600s. They characterize Bitcoin’s rise as one of the greatest price bubbles in history and say it has already popped. This week’s guest does not agree. He is betting his career on their potential, which got my attention and is the reason I am devoting an episode ofWEALTHTRACK to him and his belief in the future of digital currencies. He is Matt Hougan, the new Global Head of Research atBitwise Asset Management, a cryptocurrency asset manager founded in 2017, which has launched the world’s first cryptocurrency index fund, called the Bitwise HOLD 10 Private Index Fund. Hougan is an acknowledged expert in exchange-traded funds. He remains chairman of Inside ETFs, where he was CEO until recently. Inside ETFs is the world’s largest ETF education and events company. Hougan was also CEO of ETF.com a leading ETF authority which he helped start in 2001, when ETFs were just gaining traction. As usual, this week’s program is available to ourPREMIUM subscribers immediately. In our exclusiveEXTRA feature Hougan will describe the process of elimination he went through in deciding that cryptocurrencies were the next transformational technology.